DONETSK, Ukraine -- A senior Ukrainian rebel leader has rejected a Dutch report that concluded a Russian-made missile downed MH17 over Ukraine in 2014, killing 298 people. 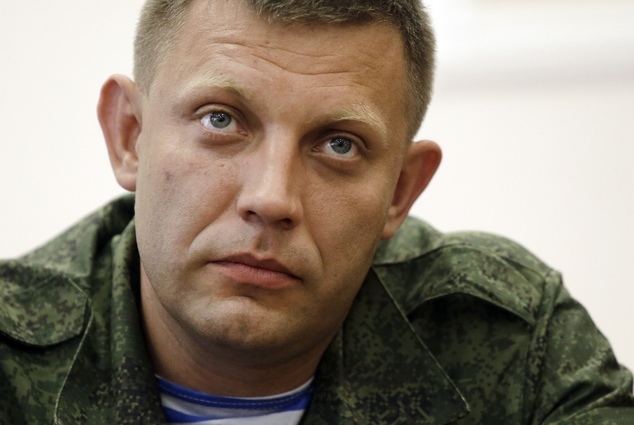 Self-proclaimed pro-Russian leader Aleksandr Zakharchenko. Aleksandr Zakharchenko told the BBC the investigation into the disaster "hadn't been carried out properly at all". Meanwhile, Russia's aviation chief called on the UN aviation body to open a fresh investigation on Wednesday. The West and Ukraine say the rebels brought down the Boeing 777, but Russia blames Ukrainian forces. The plane - flying from Amsterdam to Kuala Lumpur - crashed at the height of the conflict between government troops and pro-Russian separatists in July last year. A final report into the disaster was released on Wednesday after a 15-month investigation by an international team led by the Dutch Safety Board. Most of the victims were Dutch - 196, including some with dual nationality. The other passengers and crew were nationals from 10 countries. The report found a Russian-made Buk missile had hit the front left of the plane, causing other parts to break off. Experts say both Russian and Ukrainian armies possess these types of missiles. But Zakharchenko, leader of the self-proclaimed Donetsk People's Republic (DNR), denied on Wednesday that his forces had possessed Buk missile launchers. He criticised the board on Wednesday, questioning why it did not disclose to whom the missile belonged or the location from which it was fired. Under rules governing international crash investigations, the Dutch board did not have the authority to apportion blame. "Why were the Malaysians not given access? Why didn't they collect all the wreckage? They still haven't collected all the wreckage," he told the BBC's Tom Burridge. The unstable security situation in the east of Ukraine hampered efforts to retrieve debris and bodies in the immediate aftermath of the disaster. When asked about a statement released by Ukrainian rebels just after MH17 crashed saying they had shot down a Ukrainian transport plane, Zakharchenko said it "was probably a fake". He hit back at the Ukrainian government for not shutting its airspace over conflict-ridden territory in the east of the country - a point that was also made by the Dutch Safety Board. Board president Djibbe Joustra said there had been sufficient reason to close off Ukrainian airspace - a measure Ukraine did not take. Ukraine's Foreign Minister Pavlo Klimkin defended his country's decision not to close its airspace, telling reporters on Tuesday that no-one knew such highly-sophisticated anti-aircraft missiles had been brought into Ukraine. Mr Klimkin went on to praise the report, urging a separate Dutch criminal report currently under way to show a chain of command and bring the perpetrators to justice. On Wednesday Russian Federal Aviation Agency chief Oleg Storchevoi said he "categorically disagrees" with the Dutch investigation, which he described as "unfounded and biased". He said he had appealed to the International Civil Aviation Organization to open a new investigation into the incident. Russia vetoed a draft resolution at the UN Security Council to set up an international tribunal into the MH17 air disaster last July. President Vladimir Putin said it would have been "premature" and "counterproductive". Contrary to the Dutch report, the Russian state firm that manufactures Buk missiles - Almaz-Antey - said on Tuesday that evidence suggested the plane had been shot down by a Buk missile fired by Ukrainian forces. Using their own simulation, they said the missile had been fired from Zaroshchenke in Ukrainian-controlled territory, some 20km (12 miles) away from the area highlighted by the Dutch report. They argued the missile used was a decades-old model no longer used by Russian forces.